Handcrafted from a (Crown Lynn) teacup, this beautiful pendant makes a great gift to any kiwiana collector, or treat yourself! Long ago in China, there lived a very wealthy mandarin. He had a beautiful daughter named Koong Shee. The beautiful, young girl was the promised bride of Ta-Jin, a very old but wealthy merchant. The young girl however, fell in love with her father's secretary, a young man named Chang. Koong Shee and Chang would meet in secret beneath a large Willow tree and dream of their future together. Koong Shee was of noble descent and Chang was a mere commoner. So the young couple , no matter how great their love, would never be allowed to wed. When the girl's father found out about their secret meetings, he was furious. He banished Chang and forbade his daughter from ever seeing Chang again. Koong Shee would sit beneath the Willow tree that had once been a place of joy and would quietly weep. Her heart was filled with pain. Not only had she lost Chang but Ta-Jin was a wicked man and a very difficult person to please. Koong Shee longed to see her handsome, young Chang and her thoughts would fill with the happiness they shared while sitting in this very same spot together. As the day of the wedding drew near, Chang returned. He sent a message with Koong Shee's maid to meet him by the Willow tree. As Chang approached, he saw his beautiful Koong Shee sitting beneath the tree. Chang rushed to her side and once more held Koong Shee in his arms. They were so very much in love and did not want to be separated ever again. Chang and Koong Shee finally decided to elope and get married without her fathers permission. As they were starting to leave together, Koong Shee's father saw them and chased after the pair. The young couple raced across the bridge to a waiting boat and sailed away. A storm developed and the boat sank at sea. Suddenly from out of the storm flew two snow white doves. Seeing the young couple's love for one another, the gods transformed Koong Shee and Chang into two beautiful white doves. These two doves have lived on forever and can still be seen today flying high above the Willow Tree where Koong Shee and Chang first pledged their love. Measuring approximately 7cm x 2cm, this pendant looks stunning against a black top! Comes with a complimentary rubberised cord. 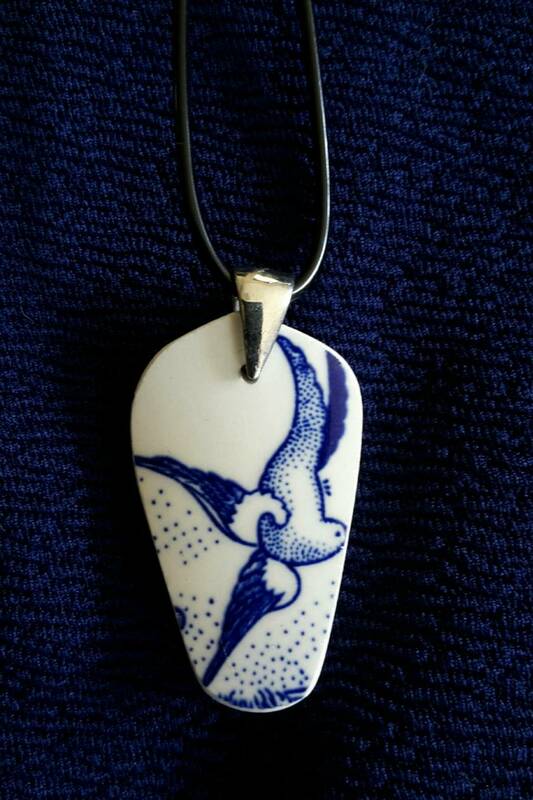 Saucery Jewellery by Ann is individually crafted from china, porcelain and crockery. Each piece might evoke a memory of our past – our childhood tea-sets, Nanna’s or Mum’s best china, or a favourite pattern you can no longer have on display. Age and the crafting process does create small imperfections - just adding to the charm! If you have a piece you wish to convert into a memorable piece of jewellery that can be arranged also. Care: each piece is fragile – it doesn’t take kindly to being dropped! If the edges become discoloured over time, a gentle clean with an old toothbrush and a little toothpaste will freshen it up. If you have any concerns, please contact me. Contact saucery to enquire about payment or shipping options.